This past week has saw us pass the six-months-since-we-came-back mark. It’s not been long in coming. Indeed, over the months since our return, I’ve frequently found myself watching the notch on our calendar, which signifies our ignominious return to 9 to 5 existence, slip ever further into the distant recesses of time gone by. 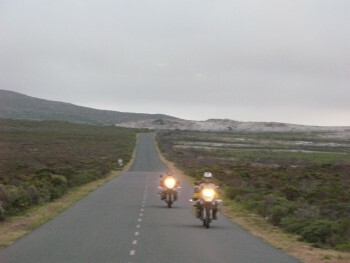 So, it was with some elation that we spent the weekend of 3-6th July cavorting with fellow adventure motorcyclists at this year’s Horizon’s Unlimited. Held every year in the depths of the Derbyshire countryside, this gathering of have-done and wanna-be motorcycling travellers is a must-attend for anyone who wants to talk to people of a similar ilk about taking a bike across Africa, Asia or the Americas. We had a wonderful time. Not least because we got to bore people with our own stories about life on the road! 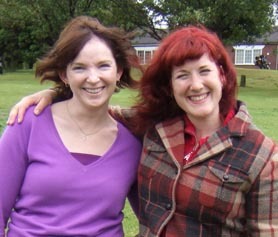 Plus, we had the pleasure of meeting up with old friends as well as making some new ones. It was particularly satisfying to be so warmly welcomed back from our trip by Sam Manicom, the self-published author of his 7 year travels around the globe. We met Sam last year, at the launch of Ted Simon’s new book, down in Dorchester. He was very supportive back then, and delighted now to see us return fresh-faced and full of tales of woe and endurance. Sam was there to promote his new book, Under African Skies, which we duly bought a copy of, and requested his autograph. The same went for Lois Pryce, whose tent was pitched not too far from our own in a field dotted with tents and motorbikes. A very jovial character, her voice carried across the field in the early morning as she chatted about the interviews she was doing for a new DVD, so after a quick bite to eat I sauntered across to ask for a copy of ‘Red Tape and White Knuckles’ which was duly signed with the message: ‘hope you think the book is gert lush’! (It turns out that Lois spent some time in Bristol, and having earlier informed her of a mix-up in which Glyn was called Mr Bristol, she made the connection and saw us as ‘fellow bristolians’). Books obtained and autographed, it was time to head off for some of the talks given by entrepid travellers who’d travelled ‘through the Stans’ (Kazakhstan, Uzbekistan etc.) or down the west coast of Africa. The latter was by a duo, Dan Adams and Ed Briggs. I’d previously made contact with Dan on Facebook, via a reader of this blog who travelled with Dan for a bit and whose trip had been cut short. I was truly amazed that they’d managed the west coast route in just over 1 and a half months more than we took to do the east coast. Especially when Ed said that he’d calculated they’d spent a total of 21 days crossing borders! Apart from the talks there were also a couple of demonstrations. One on how to skin and cook roadkill, such as rabbits, pigeons and pheasant. It definitely had the ‘yuck’ factor, but was also truly enlightening, particularly as you got to try some of the stew which I have to say was most delicious. 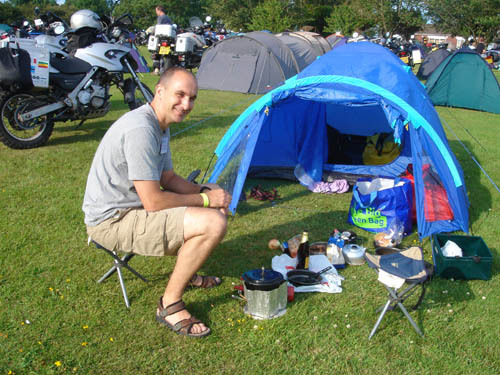 The other was ‘yoga for bikers’ – a brilliant session on how to become more elastic even when you live in a tent! I have to say, it was very relaxing indeed, so by the time we hit the road I was in a very pleasant state of mind. Which is probably why, when Glyn’s bike broke down for the second time that weekend with a broken radiator, I didn’t have my normal chicken-licken response of ‘the world’s falling to pieces’. This may also have had something to do with the fact that, rather than being stuck in the middle of the Sudan, we were nicely located at a service station on the M42, where there was mobile phone reception and a plentiful supply of sweets and chocolates for any occasion! Two hours later, and with more K-Seal in the radiator, we were on the road again. We’d obtained the K-Seal on our way up to HU, when the AA had previously attended to Glyn’s gushing motor; and now, after another call-out, we were assisted to do the same again. So, now it’s off to find someone who can mend a radiator for less than the £200 that a new one from BMW will cost! We’ve made it! 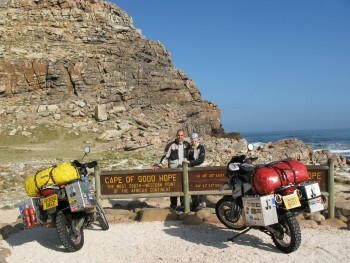 At five o’clock on 30th December 2007, we pulled up at our final destination, the Cape of Good Hope. Located within Cape Town’s fabulous Cape Point Nature Reserve, it is the most south westerly tip of the continent we’ve spent three months traversing. What a fantastic way to round off what has been a most amazing trip! We were greeted with loud shouts and much hand-waving by friends of ours who had come well-equipped with celebratory bottles of champagne (of both the alcoholic and non-alcoholic varieties). Surprised tourists milled around, wondering what was going on, until someone explained. A few wanted their photo taken with us, which made us feel like mini-celebrities, as did the paparazzi of cameras which clicked away as we parked our bikes up next to the sign marking our final end point. As we stood there, sipping the bubbly and smiling broadly at everyone, it slowly started to sink in. It was finished. 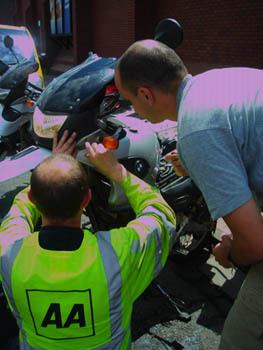 seo analysis of website No more worries about road conditions, bike failures or punctures. No more wondering where we’d be sleeping that night, or when the next shower would be. It was over! We had done what we’d set out to achieve. That little tip at the end of Africa to which we’d departed every day was right here, where the Atlantic and Indian Oceans meet. What a wonderful feeling.